Three score years ago, Dr. Martin Luther King, Jr. taught us the true meaning of the word freedom, leaving an indelible mark on America. During the Civil Rights Movement, King preached that nonviolence and civil disobedience are the only way to fight for freedom, successfully leading Blacks in their quest for the “unalienable rights” promised by our Founding Fathers. “We must forever conduct our struggle on the high plane of dignity and discipline,” he urged. Less than three weeks ago, the Black community of Ferguson, Missouri exploded in anger at the perceived inequities of their treatment by the criminal justice system. This violent outburst highlights the relevance of King’s thoughts on freedom and tactics. As tension has increased in recent months, we must recall the value of King’s nonviolent philosophy. Following the end of the Civil War, the 13th, 14th, and 15th Amendments were added to the Constitution to grant Black Americans civil and political rights, including the abolishment of slavery, citizenship, and the right to vote, respectively. Although Blacks were given these freedoms in writing, their freedoms were not recognized in practice, and so they were not actually free. Jim Crow laws and the doctrine of “separate but equal” professed by the US Supreme court in Plessy v. Ferguson (1896) upheld both segregation and discrimination. Blacks were not allowed to attend the same schools or churches as Whites. They had separate bathrooms, recreational facilities, and seating on public transportation. Even though they technically had the right to vote, they were prevented from voting through violence and legislative sleight of hand including the Grandfather Clause, literacy tests, and poll taxes. In summary, midway through the Twentieth Century, Blacks were still being denied basic freedoms. The modern Civil Rights Movement arguably began in 1948 with the signing of Executive Order 9981 by President Truman, which outlawed discrimination in the armed services. Shortly thereafter, the Supreme Court overturned Plessy v. Ferguson in its landmark Brown v. Board of Education (1954) decision, which ruled that “separate educational facilities are inherently unequal.” It took three years and the intervention of federal troops for the “Little Rock Nine” to desegregate an Arkansas high school. 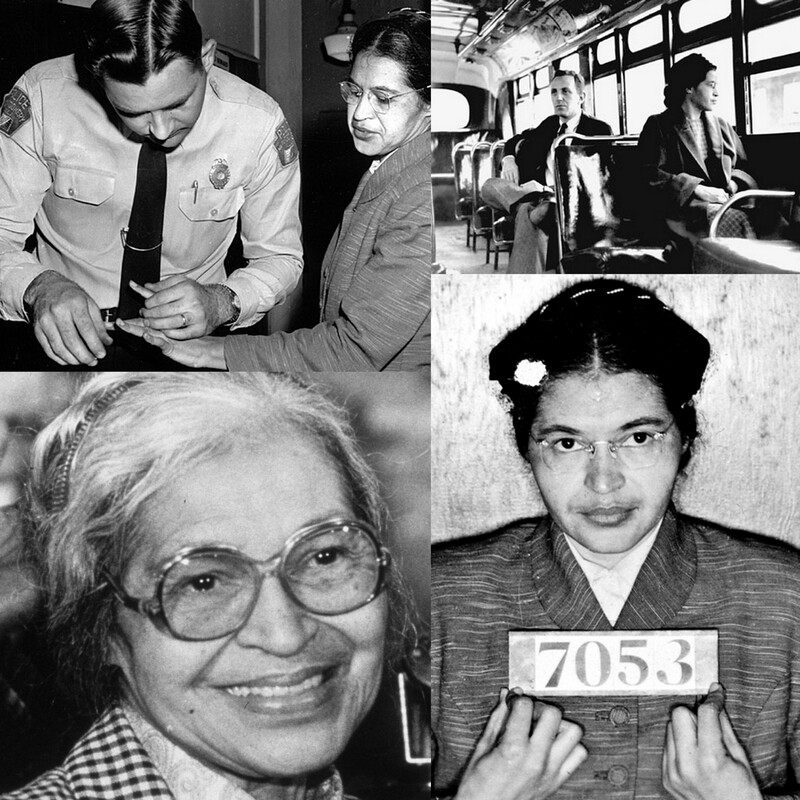 Social unrest and racial violence were again brought to the forefront when Rosa Parks refused to give up her bus seat to a White passenger in Montgomery, Alabama in 1955. This led to the emergence of 26-year-old Reverend, Martin Luther King, Jr. on the national stage, as he was elected president of the Montgomery Improvement Association. King became the central figure in the struggle for Black civil rights. Along with Charles K. Steele and Fred L. Shuttlesworth, he established the Southern Christian Leadership Conference in 1957. The SCLC advocated nonviolence and civil disobedience, and became a powerful instrument for galvanizing public opinion and implementing change. To King, mandated separate facilities, and schools in particular, were a serious obstacle to being free. Freedom, he believed, is the ability for all men to think, speak, and act in the public sphere. Education is the key to thinking, speaking, and acting in a coherent and persuasive manner. Like the biblical parable in which Jesus preaches the benefit of teaching a man to fish, rather than merely giving him a fish, King believed that freedom was not simply “given.” Rather, educating a man will, ultimately, enable him to advocate for his own freedom and, in so doing, attain that freedom. King’s view of freedom is consistent with that of the Founding Fathers, who wrote, “all men are created equal, that they are endowed by their Creator with certain unalienable Rights, that among these are Life, Liberty and the pursuit of Happiness” (Declaration of Independence par. 2). These unalienable First Amendment rights of speech, press, religion, petition, and assembly, and the newly granted Reconstruction Amendments help make men free. If we are denied any one of these rights, we are not free. King had a dream of the essence of freedom that he shared with the world at the Lincoln Memorial on August 28, 1963. According to King’s argument, safeguarding freedom requires that we live up to the promises made in the Declaration of Independence. Segregation is not consistent with freedom because segregation is a barrier to education and thus to man’s pursuit of “liberty” and “happiness.” Freedom is brotherhood, peace, and racial harmony. Freedom is being judged not “by the color of [one’s] skin but by the content of [one’s] character” (King, “I Have a Dream” 57). To King, freedom is equality. Virtuosity [is] an excellence we attribute to the performing arts, where the accomplishment lies in the performance itself…Performing artists need an audience to show their virtuosity, just as acting men need the presence of others before whom they can appear; both need a publicly organized space for their ‘work,’ and both depend upon others for the performance itself . King used the public sphere and expertly molded public opinion through his virtuoso leadership while advocating for Black political equality. there will always be a few who think for themselves…[and] will disseminate the spirit of rational respect for personal value and for the duty of all men to think for themselves. Freedom, King realized, must include justice for all. He saw the very concept of “second class citizenship” fostered by segregation as a danger to the health of the American Republic, and a threat that undermined the legitimacy of the founding documents and the principles that inspired them. Social norms are not always acceptable. We have to stand up to the injustices that plague our society. He warned, however, that “Freedom is never voluntarily given by the oppressor; it must be demanded by the oppressed” (King, “Letter From Birmingham” 5). King remained steadfast in his belief that these demands for freedom must be made without violence. I came to feel that [nonviolent resistance] was the only morally and practically sound method open to oppressed people in their struggle for freedom. Nonviolent methods are a form of free speech. Violence will frighten and intimidate people, but nonviolence will cause people to hear one’s message. 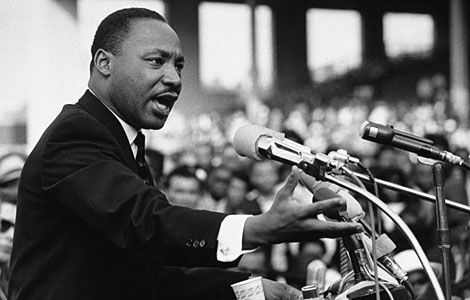 King’s nonviolent tactics included preaching love, orchestrating nonviolent demonstrations, and supporting civil disobedience. Nonviolence is a First Amendment right of which we must take advantage. He viewed nonviolence as “one of the most potent weapons available to oppressed people in their quest for social justice” (King, “My Pilgrimage” 480). In Montgomery, Alabama, in 1955, King put these words into action. Under his leadership, Blacks boycotted buses for an entire year. They walked, biked, and carpooled in protest of Montgomery’s discriminatory bus policies. Since Blacks constituted a large portion of the population in Montgomery, this mass protest caused much economic distress. The city was forced to adopt laws that ended segregation on buses. Eventually, in 1956, the protest proved successful when the Supreme Court ruled that segregation on public buses is unconstitutional. More importantly, the protest gained large media attention, which increased activism and participation in the Civil Rights movement. King’s most controversial, but necessary, performance of freedom was on display during the anti-segregation protests in Birmingham, Alabama in 1963. Following his arrest, he wrote from a Birmingham jail that we are morally obligated “to disobey unjust laws.” King asserted that a just law is one that is morally right, while an unjust law debases human personality or is inflicted upon a minority by a majority who doesn’t itself adhere to the law. “I would agree with St. Augustine that ‘An unjust law is no law at all,’ ” he wrote (King, “Letter From Birmingham” 6). King supported just laws, such as the 1954 Supreme Court decision in Brown v. Board of Education, but emphatically denied “unjust laws,” such as Jim Crow laws, which withheld basic rights from Americans. He contended that without this distinction, change would be impossible, and discrimination would continue. There is a third type of law: one that appears to be just, but is unjust in its function. King noted in his Letter From Birmingham City Jail that he was arrested for parading without a permit, which is a just law. Nonetheless, “such an ordinance becomes unjust when it is used to maintain segregation and to deny citizens the First-Amendment privilege of peaceful assembly and protest” (King, “Letter From Birmingham” 7). Therefore, in certain circumstances, we have the right to break an unjust law and the right to civil disobedience. In Birmingham, one of the most segregated cities in the nation, the court issued an unfair ruling prohibiting “parading, demonstrating, boycotting, trespassing and picketing” in a vain attempt to uphold segregation policies. King’s response was to organize peaceful sit-ins, marches, and boycotts. Nonviolent direct action seeks to create such a crisis and foster such a tension that a community which has constantly refused to negotiate is forced to confront the issue. It seeks to so dramatize the issue that it can no longer be ignored. The Birmingham Campaign began with a series of boycotts to urge businesses to end segregation in employment. King targeted local businesses during busy shopping seasons such as Easter, which really hurt business leaders. Sit-ins were organized at libraries, lunch counters, and churches to fight for racial equality in public facilities. Protesters marched to fight for voting rights. Disobeying the court’s “unjust” edict resulted in thousands of arrests. The plan was to fill the city’s jails with protesters to create the necessary atmosphere to foster negotiation. Once the jails were overflowing, policemen stopped arresting protesters and responded instead with violence. The Birmingham demonstrations proved extraordinarily effective. Th ey evoked an abhorrently excessive use of force and violence in the form of high-pressure water hoses and attack dogs aimed at peaceful demonstrators, including children, which horrified the nation and spurred public opinion nationally. More and more Americans recognized the inhumanity of the oppressors. The campaign raised awareness and led more Americans to help Black protestors in their quest for civil and political freedom. The increased support sparked an even bigger movement on August 28, 1963. As president of the Southern Christian Leadership Conference, King, along with leaders of the Congress of Racial Equality, Student Nonviolent Coordinating Committee, National Association for the Advancement of Colored People, and National Urban League, played a large part in organizing the March on Washington. The goal of the march was to shine light on discrimination in the workplace and the job market, as well as the evils of segregation. The streets of Washington were inundated with more than 200,000 demonstrators. The event garnered widespread media attention and live international television coverage. Participants peacefully marched to the Lincoln Memorial, where King delivered his iconic “I Have a Dream” speech, promoting the end of racism and freedom for all. 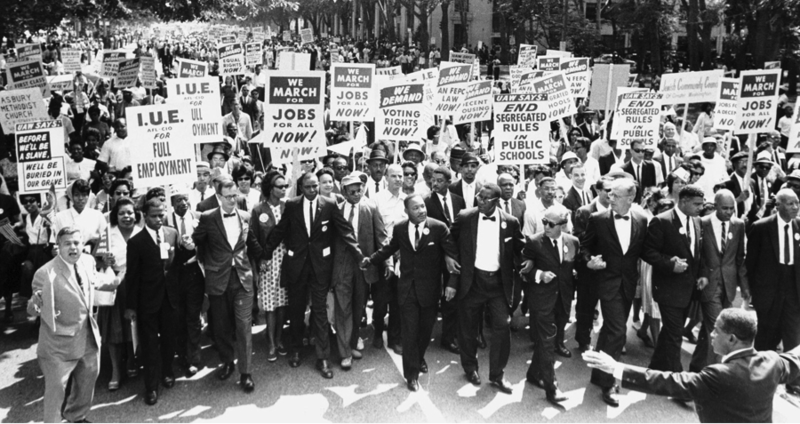 The political momentum created by this speech and the march culminated in the Civil Rights Act of 1964, which prohibited segregation in public accommodations and discrimination in education and employment on the basis of race, ethnicity, nationality, religion, and gender. This was yet another victory in Blacks’ fight for freedom. After the success of the March on Washington, King continued to support marching as an effective method of nonviolent protest and helped to organize a series of marches in Alabama. To protest unfair voting restrictions, demonstrators attempted to march along the 54-mile Highway-80 from Selma to Montgomery. The first march on March 7, 1965, known as “Bloody Sunday,” was violently and brutally halted by local law enforcement. Although the march was stopped again the following day, images of the vicious attacks on peaceful protesters by the police were televised around the globe. White and Black Americans alike were outraged. Unable to avoid the disturbing spectacle, and no longer able to ignore the reality of racial injustice, many Whites began to support Blacks in their fight for freedom. On March 25th, King and approximately 8,000 supporters completed the trek to the Alabama State Capitol. This effort was the driving force in the passage of the Voting Rights Act of 1965, which allowed Blacks to actually vote by prohibiting discrimination at the polls. King and the Black community proved again that nonviolent methods paved the way to freedom. Following his success in the South, King turned to the North where civil rights campaigns had rarely been focused. He brought his nonviolent tactics to Chicago, where he organized rallies and marches to fight for equal employment, education, transportation, open housing, and community development. Some of these rallies were predictably met with violence, which again led to media attention and increased support. Nonviolence triumphed yet again, with passage of the 1968 Fair Housing Act, which enforced equality in the buying, selling, renting, and financing of houses. Hate for hate only intensifies the existence of hate and evil in the universe…Somewhere somebody must have a little sense, and that’s the strong person. The strong person is the person who can cut off the chain of hate, the chain of evil. And that is the tragedy of hate, that it doesn’t cut it off. It only intensifies the existence of hate and evil in the universe. Somebody must have religion enough and morality enough to cut it off and inject within the very structure of the universe that strong and powerful element of love. Only love, he believed, can break the vicious cycle that entraps us. Loving the people who oppress you may seem strange, but hate is unproductive and destructive. Love, on the other hand, heals, and wins both hearts and minds. Let us not seek to satisfy our thirst for freedom by drinking from the cup of bitterness and hatred….We must not allow our creative protest to degenerate into physical violence. Responding with violence is counterproductive. It gives the oppressors more of a reason to oppress individuals. Nothing is more eloquent that resisting your attackers by “turning the other cheek.” Moreover, peaceful well-organized protests that draw on the preaching of Jesus of Nazareth are a way of performing both solidarity (in union with fellow marchers) and dignity (in literally “standing up” for justice). By preaching love and peace, King captured the support of both Blacks and Whites. show[ed] that young black males in recent years were at a far greater risk — 21 times greater — of being shot dead by police than young white men. These statistics reflect the fact that many police officers see black men as expendable figures on the urban landscape, not quite human beings. These statistics were borne out yet again this past August in Ferguson, Missouri, where a White-majority police force supervises a Black-majority community. On November 24, 2014, the St. Louis county grand jury announced its decision not to indict the White police officer who killed an unarmed black teenager. Large crowds took to the streets of Ferguson and angry riots convulsed the community in violence and destruction of property. The demonstrations quickly spread throughout the country to cities such as New York, Chicago, and Oakland. This violence, though predictable, is counterproductive, as it tends to disproportionately destroy the property of the very community that is protesting. Neighborhoods in Watts, Newark, and Detroit still show the scars of riots from nearly sixty years ago. Violence frightens, intimidates, and closes rather than opens minds; it hardens ideology and impedes true progress. It polarizes rather than unifies public support. “A riot,” King said, “is the language of the unheard.” Breaking windows and setting fires is not the way to get people to listen. Further, violence serves to legitimize the state’s use of (often overwhelming) violence in response. In short, violent protest is an ineffective means to achieve one’s desired ends. Researchers used to say that no government could survive if just 5 percent of the population rose up against it. Our data shows … that no single [nonviolent] campaign … failed after they’d achieved the active and sustained participation of just 3.5 percent of the population. Nonviolent methods will continue to harbor awareness and gain supporters, enabling Americans to reach freedom. Martin Luther King Jr. was a visionary who sacrificed his life in pursuit of social justice. King’s courageous crusade against racial intolerance yielded a brighter future for all Americans and provided inspiration for untold millions. “We have an opportunity to make America a better nation,” he promised (King, “I’ve Been” 253-255). Together, let’s use the tools of peaceful resistance to help realize King’s cherished dream of a better United States of America. Arendt, Hannah. “What Is Freedom?” Between Past and Future: Eight Exercises in Political Thought. New York: Penguin, 2006. 143-69. Print. Apuzzo, Matt. “As Protests Take a Turn, Holder Finds It Harder to Ease Racial Tensions.” New York Times 25 Nov. 2014. The New York Times Company. Web. 26 Nov. 2014. Blow, Charles. “Fury After Ferguson.” New York Times 26 Nov. 2014. The New York Times Company. Web. 26 Nov. 2014. Clayton, Ed. Martin Luther King: The Peaceful Warrior. Englewood Cliffs, N.J., Prentice-Hall:, 1964. Print. Fisher, Max. “Peaceful Protest Is Much More Effective than Violence for Toppling Dictators.” Washington Post. The Washington Post, 5 Nov. 2013. Web. 6 Dec. 2014. Hodgson, Godfrey. Martin Luther King. London: Quercus, 2009. Print. Kant, Immanuel, and James Schmidt. “An Answer to the Question: What Is Enlightenment?” What Is Enlightenment? Eighteenth-century Answers and Twentieth-century Questions. Berkeley: U of California, 1996. 58-65. Print. King, Martin L., Jr. “I Have a Dream.” Speech. Lincoln Memorial, Washington, D.C. 28 Aug. 1963. American Rhetoric. Web. 15 Nov. 2014. King, Martin L., Jr. “I’ve Been to the Mountaintop.” Speech. Mason Temple (Church of God in Christ Headquarters), Memphis, Tennessee. 3 Apr. 1968. American Rhetoric. Web. 16 Nov. 2014. King, Martin L., Jr. “Letter From Birmingham City Jail.” The Martin Luther King Jr. Center for Nonviolent Social Change. 16 Apr. 1963. Web. 16 Nov. 2014. King, Martin L., Jr. “Loving Your Enemies.” Speech. Dexter Avenue Baptist Church, Montgomery, Alabama. 17 Nov. 1957. The Martin Luther King, Jr. Research and Education Institute. Web. 21 Nov. 2014. King, Martin L., Jr. “My Pilgrimage to Nonviolence.” The Martin Luther King Jr. Papers Project. 1 Sept. 1958. Web. 21 Nov. 2014. “Martin Luther King Jr. – Biographical.” Nobelprize.org. The Nobel Foundation. Web. 22 Nov. 2014. The Martin Luther King Jr. Center for Nonviolent Social Change. The King Center. Web. 24 Nov. 2014. The Martin Luther King Jr., Research & Education Institute. Stanford University. Web. 20 Nov. 2014. The New York Times Editorial Board. “The Meaning of the Ferguson Riots.” New York Times 25 Nov. 2014. The New York Times Company. Web. 26 Nov. 2014. Selby, Gary S. Martin Luther King and the Rhetoric of Freedom : The Exodus Narrative in America’s Struggle for Civil Rights. 5 Vol. Waco, Tex. : Baylor University Press, 2008. Print. Studies in Rhetoric and Religion . United States of America. Declaration of Independence. By Thomas Jefferson. N.p. : n.p., 1776. Print.